Shopping for Defense of the Ancients Bags? Zippered duffel bag inspired by the Defense of the Ancients 2 video game. Features a red DOTA logo with white lettering. Fans of the DOTA series are sure to love this! Fans of the DOTA series are sure to love this. 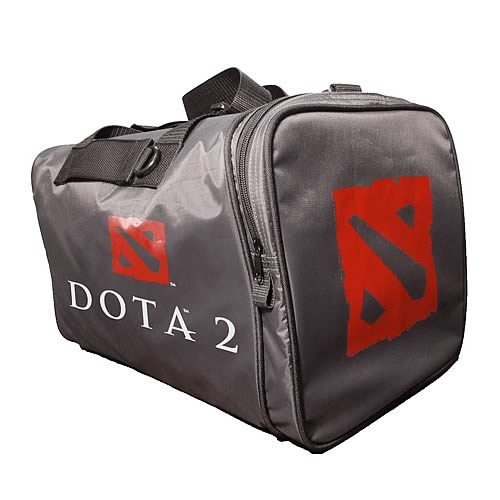 Based on the Defense of the Ancients 2 video game, the zippered Defense of the Ancients 2 Duffel Bag from Crowded Coop is a high-quality nylon duffel bag that features a red DOTA logo with white lettering on a black background. It measures about 18-inches long x 12-inches tall x 11-inches wide. Show your gamer pride and order yours today! Defense of the Ancients is a hit PC game series and a mod for the popular Warcraft III: Reign of Chaos.